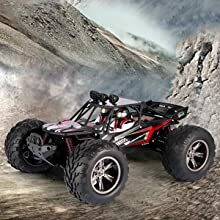 2WD RC ALL TERRAIN OFFROAD REMOTE CONTROL CAR - Fast speed and good performance 1/12 rc truck to play in all terrains, like mountain roads, grassland, sandy land, snow etc. Desert buggy style body, roll cage and driver cockpit. Flat roof design is a good platform to place a camera & ligt (not included). 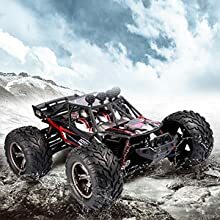 4 INDEPENDENT SUSPENSION & SHOCKPROOF RC TERRIAN CAR, 2.4 GHz CONTROL SYSTEM - Four Wheel independent suspension system for great shockproof and tougher, stronger, faster. With 2.4 GHz radio system, you'll never get any radio interference with other car. Remote control distance of 60 meters. 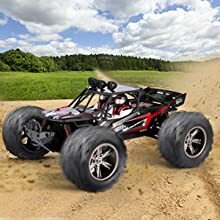 FAST SPEED DESERT TRUCK & HIGHT CAPACITY BATTERY - With powerful moter and realistic-looking rubber tires, the maximum speed is up to 24 MPH with Li-ion 9.6V 800mAh. Desert buggy cars with 6A large power ciruit system and high temperature protection system. 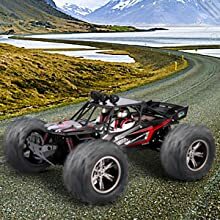 AFTER-SALE SERVICE - Vatos off road remote control cars are high quality standards. Best car control remote for kids and adults. We offer Life-time technical support and guaranteed 100% return or exchange. The maximum speed can be reached up to 26MPH/h. 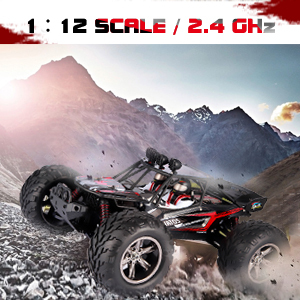 Just like a real racing car, it shows an unexpectedly amazing speed and super climbing ability.